One of the hardest things to do in life is say goodbye to a dying loved one. Jean C. West knows this from personal experience. 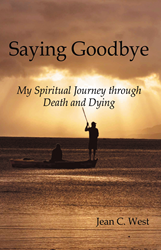 West, author of “Saying Goodbye,” is a former hospice volunteer, who was at the side of her husband and siblings when they passed away. Through observation and personal experience, she learned that caregivers and family members need to be more transparent with everyone involved, including the one dying. She sought to write a book that not only informs readers about various situations accompanied with death, but also to help improve the communication process with families. West found that families were hurt that loved ones could not properly say goodbye and children were often not told the situation. This lack of clarity culminated into grief that turned to anger. “Kind, straight forward communication gives the patient time to deal with what is happening to them and enables them to have time with friends and family,” West said. While proper communication is integral, how to respond to different scenarios is also key. Her book touches on a wide variety of situations involving death to help families cope. Some of these topics include the death of a child, how to get closure and preparation for a funeral. West said all of these communication tactics and examples are integral because they all add up to learn how to properly say goodbye before it is too late. “This book is intended to help the dying and those left behind to understand what to expect and how to deal with it,” West said. Jean C. West is a retired dental hygienist and former hospice volunteer. She taught dental hygiene at the University of Pretoria in South Africa. West lives in Savannah, Ga., with her husband.